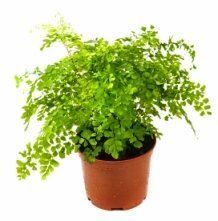 Maidenhair Fern is a foliage plant with arching, black, wiry fronds covered with green triangular leaflets, called pinnae. One of the most commonly grown in a container, Adiantum raddianum is well-worth growing for its stunning foliage. It will live a long time, too, if you can meet its need for high humidity. This beautiful fern grows from rhizomes, that spread quickly just under the surface of the soil. It can reach a width of 24 in (60 cm) or more. You'll enjoy many plants over time by propagating this fern. It's easy to divide. Repot in spring when it has outgrown its pot, using a container that provides good drainage. This is a good time to divide the fern, if needed. Not many pests bother Maidenhair Fern. However, scale and mealybugs are the most common. Check the fronds regularly for infestations. They are much easier to remedy if caught early. Somewhat difficult to grow, this tropical native demands high humidity which is not practical in most homes. Grows best in terrariums where humidity is kept at a high level. Drafts and dry air will cause leaflets to shrivel. Pruning tip: Cut the stems off at the base if the leaflets dry up or fall off. Keep soil moist and raise the humidity around the fern to encourage new growth. Mist twice a day until new shoots appear. Yellow leaf tips are often a sign of overwatering. Trim off yellow leaflets to keep the fern looking neat and reduce watering. Also, check the roots to see if they have rotted. Healthy fern roots have white to light brown tips. If the roots are mostly black, get rid of it -- it's too far gone. Brown leaflets may be caused by low humidity, although old fronds naturally turn brown. Cut them off and boost the humidity around your fern. Wilted fronds are likely a symptom of underwatering. Always water thoroughly to avoid any dry pockets in the soil. Height: 6-15 inches (15-38 cm). Humidity: Requires moist air that rarely drops below 50% relative humidity. Use a humidifier or plant in a terrarium. Soil: Combine half potting mix with half peat moss. Don't use potting mix that contains fertilizer (it can dissolve too fast and burn delicate fern roots). Fertilizer: Feed once a month spring through summer with a balanced houseplant fertilizer diluted by half. Fertilize after watering to prevent burning roots. Propagation: Division. This fern grows from rhizomes that spread horizontally just beneath the surface of the soil. 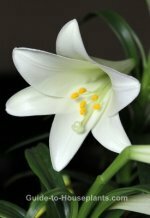 Divide clump in spring, leaving rhizome attached to 1-2 fronds, and pot in its own container.